Here is my movie review for it. I won't spoil too much but just to be safe. 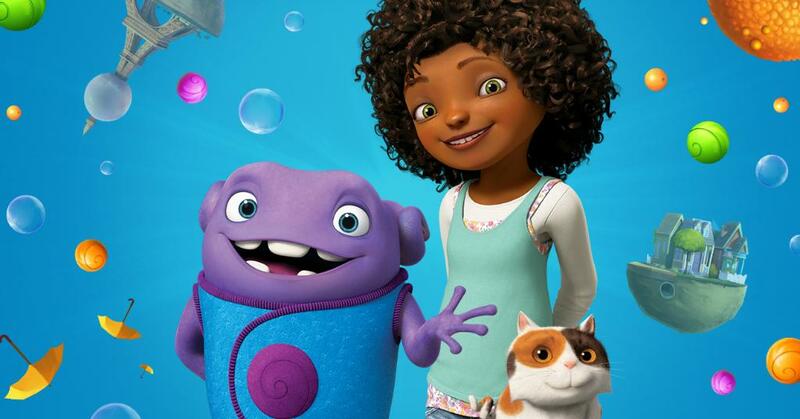 Home teaches you about love, family, and fitting in. I think it is also very emotional movie at some parts. It is very funny and enjoyable for the family. However at the end, I believe it trails off a little bit and makes it hard to follow. But that's just my opinion. "Oh" the main character who is a purple alien (top left) has made a mistake (I won't say what) and it puts him in big trouble. Tip. (center) is on a journey to find her mom with her cat, Pig. (bottom right) when she runs into Oh. She and Oh travel together to find her mom and save the world from Gorge, who keeps on attacking Oh's species. When Oh becomes captain of his people. he realizes that the reason Gorge keeps on attacking them because he was sad-mad. Why? I won't spoil to much it will ruin it if you one day happen to watch it. When Oh starts dancing along with pig the cat and Tip. I would also highly recommend this movie.